This post is sponsored in conjunction with #SpringSweetsWeek. I received product samples from sponsor companies to help in the creation of the Spring Sweets Week recipes. All opinions are mine alone. Almost 20 years ago, a coworker gave me this recipe and an introduction to the guy who would eventually become my husband. I was crazy busy working full time, going to school nights, and spending as much time with him as possible. There was no time for baking, so I filed away the recipe for "some day." Adams Extracts sent us some great products for Spring Sweets Week, including their Lemon Extract. I took some time going through my recipe box, and there was the recipe she'd given me. Totos were a holiday staple in my family, though we'd always had chocolate ones. I knew that this version would be perfect for spring. The dough comes together super easy. I use a cookie scoop to keep them all the same size, but you can eyeball it if you want. I scoop them all onto parchment, then roll them into balls, and place them on the sheets. I baked 8 at a time on half sheet pans. They'll be lightly golden brown on the bottom. While they were cooling, I put together the icing. I use a bowl that's on the smaller, deeper side. Flip the cookie upside down, dip the tops and then invert it back onto the cooling racks. I place mine over the baking sheets or parchment to keep the cleanup to a minimum. Everything's always better with sprinkles, right? Sprinkle Pop had such a great selection I had a hard time choosing! I finally settled on the Cottontail Confetti mix. I just loved all the different pastel colors. Make sure you get the sprinkles on quickly, before the icing sets up on you. We absolutely loved these. The soft lemony cookie, that's not super sweet, perfectly balanced with the lemony glaze and festive sprinkles. I'm so glad the recipe made 4 dozen cookies, because I could put some out for the guys and still have plenty to photograph without them hovering over me! Be sure to enter for a chance to win one of the prize packages from Adams Extract, Sprinkle Pop and the other amazing #SpringSweetsWeek sponsors down below. You can check out the prize packages here http://bit.ly/2FzoKeE! Cream together sugar and shortening. Add eggs, milk, and extract. Combine flour and baking powder. Add to bowl and beat until combined. Dough will be sticky. Using a cookie scoop, divide into 48 portions. Roll into balls. Place on parchment lined sheets. Bake for 12 to 14 minutes, bottoms will be slightly browned. For the icing, cut the shortening into the sugar in a large bowl. Beat in milk and lemon extract. Dip the tops of cookies into the icing, then set onto wire racks over baking sheets or parchment paper. Top with sprinkles. Allow to set up for about 4 hours. 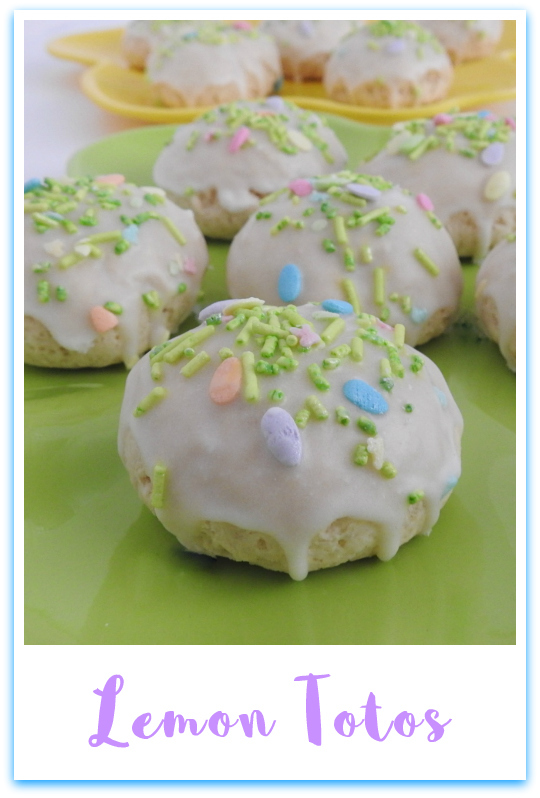 Lemony treats are perfect for spring and these cookies look insanely delicious! What a fun name for a delicious looking treat. I have never had totos before but these sound yummy! I love lemon sweets! I also had never heard of totos before, but these look and sound amazing. I am such a sucker for anything lemon! I've never heard of them, either. But they sound and look delicious. And I'm a total sucker for lemon cookies. Mmmm do these ever look delicious! The sprinkles are such a fun touch, too. These look like perfect lemon pillows! And how cute are those sprinkles?! I want a couple of these little lemon balls for dessert tonight. They look so yummy. 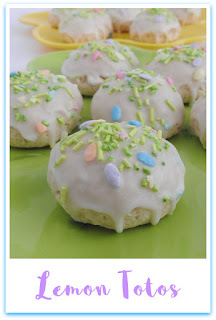 These look delicious and I love the fun sprinkles on them! These look addicting! shame on you! lol! What a cute story about the origins of this recipe!!! I love love love lemon EVERYTHING!!! And I am going to definitely try these.. 🎉🎉 Thanks for the amazing recipe! !